Adidas Golf makes golf shoes, golf apparel, golf bags, and accessories for golfers who tee it up with ultimate golf performance in mind. Already familiar with some of the greatest athletes in the world, adidas has introduced technological advances such as ClimaCool, Z-Traction, FitFoam, and ThinTech. 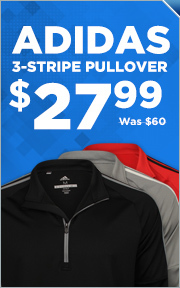 Adidas Golf produces advanced equipment developed with the demands of competition in mind. Global Golf is committed to bringing golfers around the world adidas golf apparel, adidas golf shoes, and other products and accessories at a tremendous value.